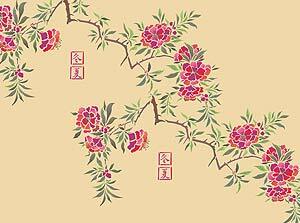 The elegant Large Azalea Flower Stencil is a large deluxe designer stencil based on historical Chinese Azalea studies, developed as a contemporary oriental flowers and branches design with integral decorative Chinese calligraphy motifs, originally meaning Winter and Summer. This easy to use large stencil comes on 4 large sheets – 2 sections in 2 layers – see details and size specifications below. 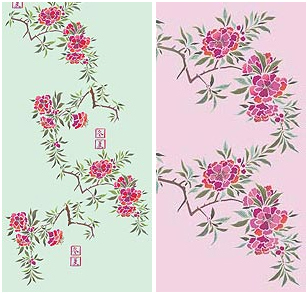 The Large Azalea Flower Stencil is a beautiful addition to the Motif designer stencil range and home owners, interior designers and cutting edge decorators will appreciate the true versatility of this design – it can be used as a single frieze or repeated randomly, horizontally, vertically and diagonally, stretching across large spaces, with graceful arches and flowering branches. So the stencil can be adapted to fit most spaces, even with unusual dimensions, working well on standard flat walls, panels and alcoves, adapting to ‘climb’ up stairs, stairwells, entrance halls and other uniquely shaped spaces. See our examples on this page of different layouts, showing diagonal, vertical and horizontal repeated layouts. 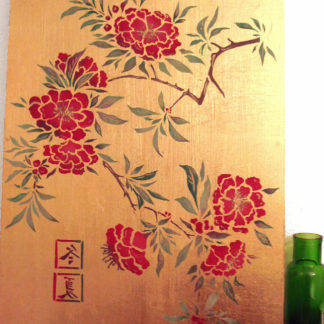 This is a large version of the Chinese Azalea Flower Stencil. 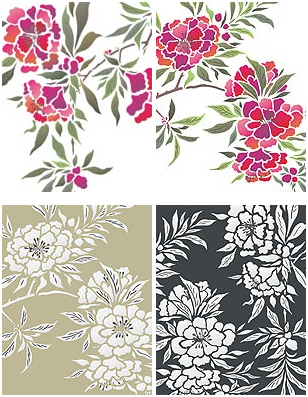 The Large Azalea Flower Stencil is equally beautiful in single colour palettes or multi coloured schemes, as well as traditional Chinese colour schemes on gilded or other opulent backgrounds. 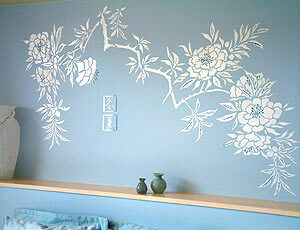 Above – the Large Azalea Flower Stencil on dramatic turquoise background in Ice White Stencil Paint. Above – shows the two sections of this stencil on a golden background. Above – Close up detail of right section stencilled in Very Berry, Azalea, Cerise, Blue Sage, Verbena, Mocha and Coffee Bean Stencil Paints on a pale aqua background. Above right – decorative calligraphy motifs ‘Winter’ (top) and ‘Summer’. Below – the same colours on white. Above left – a random vertical repeat of the two sections of this design. Above right – regular vertical repeat. 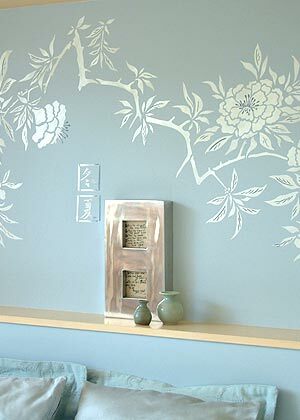 See also the smaller scale version of this design the Chinese Azalea Flower Stencil – also the Cherry Blossom and Moon Stencil and Abstract Oriental Stencils, for complementary designs. 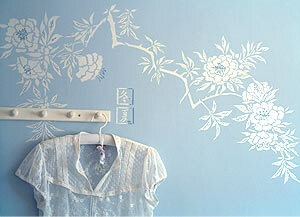 Stencil this oversize design with our Stencil Paint or Fabric Paint ranges and our Stencil Rollers and Stencil Sponges. 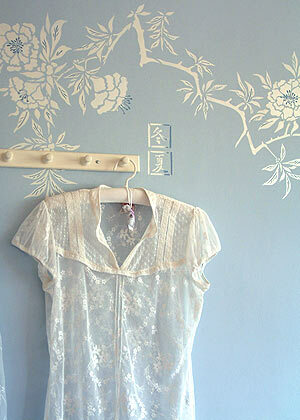 Or use coloured spray paints – to cover large areas. 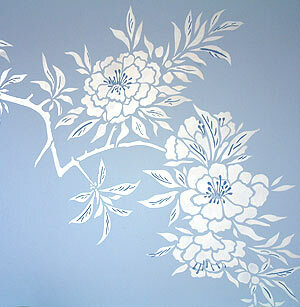 Above – Large Azalea Flower Stencil has been stencilled as a frieze across a bedroom wall in Ice White and Vanilla Stencil Paint using a Stencil Roller and then over-stencilled with Pearl Metallic Stencil Paint; layer two details of stamens and leaf veins are then stencilled in Navy Charcoal Stencil Paint. 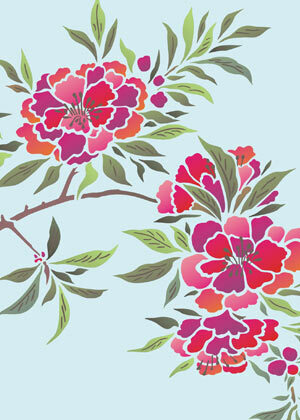 Above – Large Azalea Flower Stencil, This frieze utilises all four sheets of the stencil. 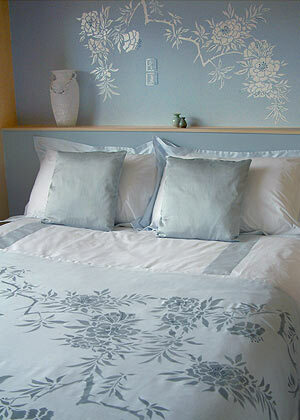 Above and below – the Large Azalea Flower Stencil shown stencilled as a frieze above a bed using the same technique as described top, using Ice White, Vanilla, Pearl Metallic and Navy Charcoal Stencil Paint. Above – close up of right section of the Large Azalea Flower Stencil layer one and two. Colours as above. Above – the two main sections of this stencil repeated twice horizontally – stencilled in Ice White and Shoreline Stencil Paint on a black background. 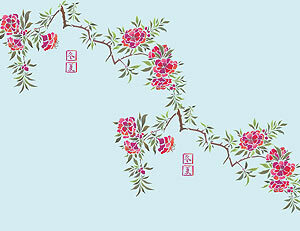 Above – the two main sections of this stencil repeated twice diagonally – stencilled in Very Berry, Azalea, Cerise, Blue Sage, Verbena, Mocha and Coffee Bean Stencil Paints on a pale aqua background. Above – the two main sections of the Large Azalea Flower Stencil repeated twice in a staggered diagonal – same colours as above. Above and below – bedroom decorated with the Large Azalea Flower Stencil, as detailed above – also showing here a voile bed throw showing this design stencilled randomly in a grey mixture made with Pure White and True Black Fabric Paints Fabric Paints. Our Fabric Paints are easy to use, simply stencil with our Stencil Sponges, allow to dry and iron the reverse side with a hot iron. The decoration is then colourfast and can be washed up to 40 degrees. 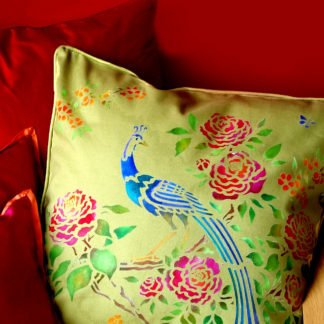 Use Fabric Paints on natural fabrics such as cotton and silk to achieve full colourfast results. Man-made fibres do not hold the colour pigments so well and fade easily. 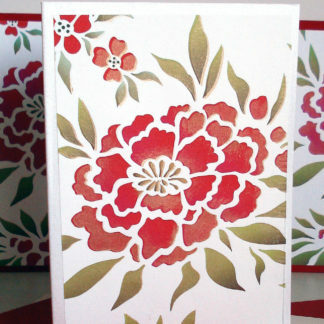 Easy to use and extremely versatile two layer stencil on four sheets. 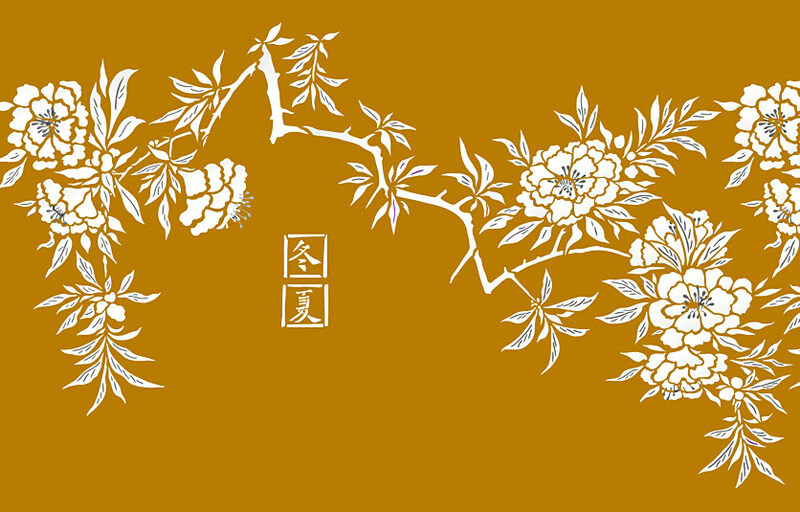 A left and right layer one section which make up the make design elements of this stencil – the azalea flowers, leaves and branches – and a left and right layer two section that align with their layer one counterparts. All sheets have alignment and registration dots for easy usage. When both main sections are joined together as a single frieze the design measures approximatley 120cm (47 1/4″) wide x 67cm (26 1/2″) deep. 1. Layer 1 left section – the design is 61cm (24″) wide x 57cm (22 1/2″) deep at furthest points on a sheet 80cm (31 1/2″) wide x 66cm (31 1/2″) deep, with registration dots. 2. Layer 2 left section – the leaf veins and stamens align with the layer one shapes on the same sized sheet, with registration dots. 3. Layer 1 right section – the design is 61cm (24″) wide x 60cm (23 1/2″) deep at furthest points on a sheet 80cm (31 1/2″) wide x 66cm (31 1/2″) deep, with registration dots. 4. Layer 2 right section – the leaf veins and stamens align with the layer one shapes on the same sized sheet, with registration dots. The width of a full blown flower is approximately 16cm (6 1/4″). 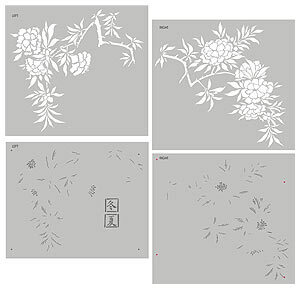 Left – the four sheets of the Large Azalea Flower Stencil.